HOUSTON (CN) – A conservative voter-fraud watchdog claims Texas’ most populous county is violating federal law by refusing to let it inspect the county’s voter rolls for people who aren’t U.S. citizens. The Indianapolis-based Public Interest Legal Foundation sued Harris County Voter Registrar Ann Bennett on Thursday in Houston federal court. The complaint was filed by in-house attorneys and lawyer Andy Taylor in Brenham, Texas. With 4.5 million residents, Harris County, home to Houston, is the third-most populous county in the United States. The foundation’s spokesman Logan Churchwell said in an interview it is compiling data on noncitizens in Texas who have either self-reported that they mistakenly registered to vote, or whose status as ineligible voters came to the attention of voting officials when they stated they are not citizens on jury duty questionnaires. The Public Interest Legal Foundation’s research in Texas follows up on its voter-roll studies in Virginia and New Jersey. In a report released last year, the foundation said that Virginia removed more than 5,500 noncitizens from its voter rolls from 2011 to May 2017, and that 1,852 of those people had cast ballots. Churchwell said the foundation’s research has found the majority of noncitizens who register to vote do so by accident, with no thoughts of fraud. Green-card holders are lawful residents, but they aren’t eligible to vote. Signed by President Bill Clinton, the National Voter Registration Act of 1993 requires states to offer voter-registration applications to people applying for, or renewing, their driver’s licenses. 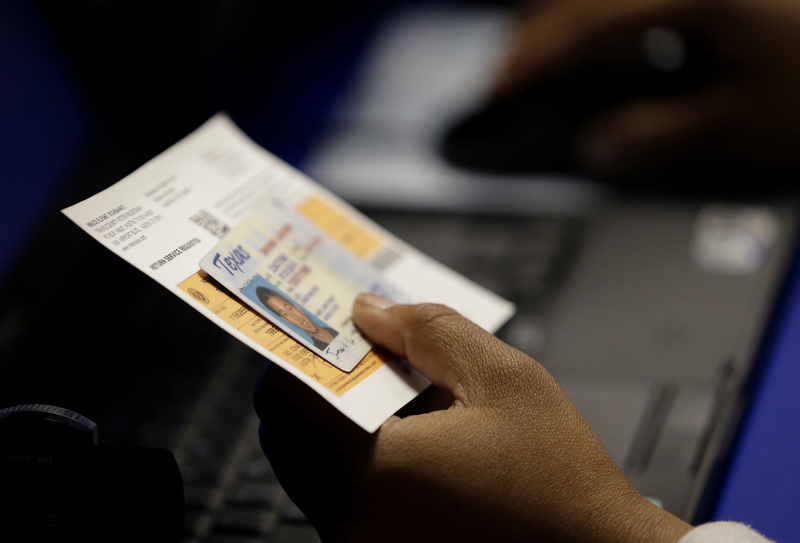 Congress passed the law to make it easier for people to register to vote. The conservative watchdog asked Harris County last December to let it inspect the county’s documents and communications pertaining to all registered voters who potentially are not citizens, or who have been removed from the county’s rolls, dating back to Jan. 1, 2006. Though the foundation’s request is governed by federal law, Harris County said it was treating the request as if it was made under the Texas Public Information Act and asked Texas Attorney General Ken Paxton to clarify if it has to provide the records. In a March 15 advisory opinion, a state attorney said that Harris County could not include Social Security and driver’s license numbers, home addresses, birth dates and completed juror questionnaires on voter records it discloses, but that it had to release some information not deemed confidential by Paxton’s staff. Bennett, the Harris County voter registrar, sued Paxton on Friday afternoon in Travis County Court, seeking a declaration that the voter records Paxton’s office said must be disclosed are exempt from disclosure under the Texas Public Information Act. Churchwell says all Harris County has to do is redact that information before it hands over the records, but county attorney’s office spokesman Robert Soard told the Houston Chronicle on Friday the county believes it does not have to disclose the records under state law. Soard said county officials do not believe it has a problem with noncitizens voting, the Chronicle reported. But Thursday’s lawsuit cites former Harris County Tax Assessor-Collector Mike Sullivan’s 2015 testimony before the Texas House Elections Committee. Tax assessor-collectors are in charge of voter registration. “When asked if his office ‘ever discovered that someone registered is not an American citizen?’ Sullivan replied, ‘Yes sir … We turn that over to the Harris County District Attorney’s Office on a regular basis. The last letter I signed had over 300 cases on it,’” the lawsuit states. Sullivan estimated that each month he reported hundreds of similar cases to the DA, so that the annual number was in the low thousands, according to the complaint. Churchwell said the foundation did not investigate Sullivan’s claims in 2015 because it formed its in-house research department in 2017. The watchdog seeks an injunction ordering Harris County to supply the requested records, and a declaration that its refusal to do so violates the National Voting Rights Act. One of its staff attorneys who filed the lawsuit is J. Christian Adams, who has been a guest commentator on Fox News. Hired by President George W. Bush’s administration in 2005, Adams was an attorney in the Justice Department’s Civil Rights Division until he resigned in May 2010. President Donald Trump picked Adams to serve on his now-defunct Presidential Advisory Commission on Election Integrity. Trump formed the commission in May 2017 to investigate his claims that Hillary Clinton won the popular vote by nearly 3 million votes for the November 2016 presidential because millions of unauthorized immigrants had voted illegally. He dissolved the commission in January after several states refused to provide voter records.